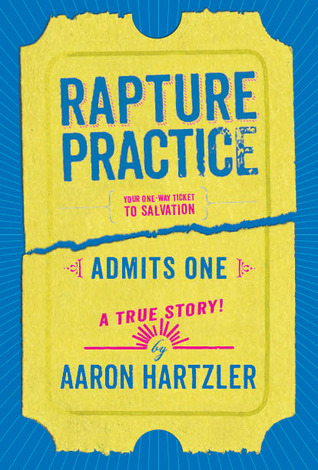 Rapture Practice: My One-Way Ticket to Salvation, A True Story by Aaron Hartzler. Grades 7 and up. Little, Brown Books for Young Readers, 2013. 390 pages. Review copy provided by my local library. Aaron Hartzler grew up in a home where he was taught that at any moment the Rapture could happen - that Jesus might come down in the twinkling of an eye and scoop Aaron and his family up to heaven. As a kid, he was thrilled by the idea that every moment of every day might be his last one on earth. Aaron Hartzler's story is one that many teens will be able to identify with. The search for religion and starting to question the beliefs one has been raised with are issues that LOTS of teens are dealing with. Aaron treats these issues with humor and a lot of heart, acknowledging that he loves his family and they've given him a strong foundation, even if he doesn't believe everything they do. There are plenty of stories about teens questioning their religion, but memoirs are another story. I'd love to see more memoirs for teens being published. Yes, kids identify with characters in novels, but it's another thing to know that this is a true story, that the author actually lived through this, came out on the other side and wrote a book geared for teens. The book maybe was a little overly long and the scenes are very detailed, reading like a novel. I think some of those scenes could have been cut in the interest of streamlining. Still, I enjoyed reading it and getting to know Aaron. Once Was Lost by Sara Zarr is a novel about a pastor's kid questioning her faith. The tone's different from Rapture Practice, but this would be a good choice for teens interested in the storyline of questioning faith. Rapture Practice is on shelves now! Happy Nonfiction Monday! This week's roundup is at Biblio Links, so make sure you check it out!